"As someone who has spent forty years in psychology with a long-standing interest in evolution, I'll just assimilate Howard Bloom's accomplishment and my amazement. "-DAVID SMILLIE, Visiting Professor of Zoology, Duke University In this extraordinary follow-up to the critically acclaimed The Lucifer Principle, Howard Bloom-one of today's preeminent thinkers-offers us a bold rewrite of the evolutionary saga. He shows how plants and animals (including humans) have evolved together as components of a worldwide learning machine. He describes the network of life on Earth as one that is, in fact, a "complex adaptive system," a global brain in which each of us plays a sometimes conscious, sometimes unknowing role. and he reveals that the World Wide Web is just the latest step in the development of this brain. These are theories as important as they are radical. Informed by twenty years of interdisciplinary research, Bloom takes us on a spellbinding journey back to the big bang to let us see how its fires forged primordial sociality. As he brings us back via surprising routes, we see how our earliest bacterial ancestors built multitrillion-member research and development teams a full 3.5 billion years ago. We watch him unravel the previously unrecognized strands of interconnectedness woven by crowds of trilobites, hunting packs of dinosaurs, feathered flying lizards gathered in flocks, troops of baboons making communal decisions, and adventurous tribes of protohumans spreading across continents but still linked by primitive forms of information networking. We soon find ourselves reconsidering our place in the world. Along the way, Bloom offers us exhilarating insights into the strange tricks of body and mind that have organized a variety of life forms: spiny lobsters, which, during the Paleozoic age, participated in communal marching rituals; and bees, which, during the age of dinosaurs, conducted collective brainwork. This fascinating tour continues on to the sometimes brutal subculture wars that have spurred the growth of human civilization since the Stone Age. Bloom shows us how culture shapes our infant brains, immersing us in a matrix of truth and mass delusion that we think of as reality. 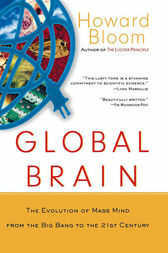 Global Brain is more than just a brilliantly original contribution to the ongoing debate on the inner workings of evolution. It is a "grand vision," says the eminent evolutionary biologist David Sloan Wilson, a work that transforms our very view of who we are and why. HOWARD BLOOM, author of the critically acclaimed book The Lucifer Principle: A Scientific Expedition into the Forces of History, is a Visiting Scholar at New York University. He is a member of the New York Academy of Sciences, the National Association for the Advancement of Science, the American Psychological Society, the Academy of Political Science, and the Human Behavior and Evolution Society, as well as the founder of the International Paleopsychology Project. He has been written up in every edition of Who's Who in Science and Engineering since the publication's inception.